Most people these days when they purchase a new refrigerator they almost always want one of two features if not both; automatic icemaker and water/ice dispenser in the door. Each one requires that you hook up a water line directly to the back of the machine in order to have a constant flow of water. In order to improve the taste of the ice and or water, it is highly recommended that you purchase a separate refrigerator water filter. For this article, we did a lot of online research and discovered that there are a good number of water filters on the market. We put together a list of the best refrigerator water filters we could find for you to look at. We also included reviews to give you more information on each of the ones that we identified. This GE branded water filter cartridge is designed to work specifically with all models of General Electric refrigerators that are fitted with automatic icemakers and water dispensers. It capable removing more than 20 different types of known contaminants including several types pharmaceuticals that have been commonly found in many municipal water supplies these days. Each cartridge is designed to filter up to 300 gallons or six months, whichever comes first and then a new one should be installed and the old one discarded. Depending on the model of GE refrigerator and where it is installed it does not require any special tools to install or remove, just pop it in place and twist to lock it in. If you have a GE brand refrigerator and you are worried about the water that goes into the ice and water that comes out of it, you should look into this water filter. These days all Frigidaire refrigerators that come with automatic icemakers or ice and water through the door include a water filter system built in. 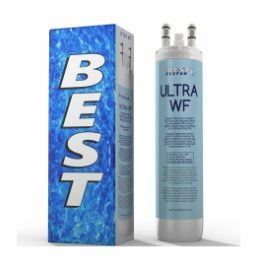 The Best ULTRAWF compatible water filter was designed to work with all Frigidaire ULTRAWF water filter systems. These cartridges help to provide clean and safe drinking water and water for ice cubes for those who are concerned about the water in their house. The cartridge features a high-quality carbon media that helps to trap the contaminants that could be lurking inside the water coming into your home from a well or municipal water supply. The water passes through several layers of the carbon material and with each pass as much of the foreign materials are absorbed into the carbon. Each cartridge is rated for 6 months of use and then it should be replaced with a brand new cartridge and the old one discarded. The package includes stickers for marking the date of when it was installed. If you own a Frigidaire refrigerator and it has a ULTRAWF water filter system built in this cartridge would be a suitable replacement for the OEM filter at a fraction of the cost. 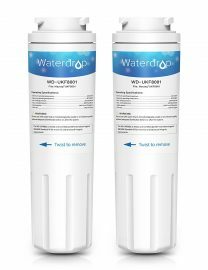 Waterdrop makes a line of high-quality refrigerator water filter replacement cartridges that fit a wide range of refrigerators on the market today. There is bound to be one that will fit your make and model that you currently have in your home. If you own a Kenmore/Maytag or Kitchenaid refrigerator, Waterdrop is the replacement cartridge for you. It is designed to provide you and your family with safe and great tasting water and ice directly from your refrigerator. The package includes two replacement filter cartridges that are designed to work with a corresponding filter for Kenmore, Maytag, and Kitchenaid refrigerators. Each filter cartridge contains multiple layers of carbon filter media all designed to remove a number of harmful contaminants from the water as it passes through the filter. The filter cartridge is designed to function up to 6 months and then it needs to be replaced with a brand new cartridge. The Waterdrop brand filter cartridges are a definite value over the high cost of OEM filter cartridges and they offer the exact same capabilities at a much lower price. The EveryDrop Refrigerator Water Filter Cartridges are designed especially for use with all Whirlpool built-in water filter systems. They are also certified to fit with several other brands of refrigerator water filter systems such as JennAir, KitchenAid, Maytag, and Amana. The triple filtration technology is designed to filter out the largest number of known harmful contaminant. They are designed to continuously provide safe and great tasting drinking water and ice for up to six months. 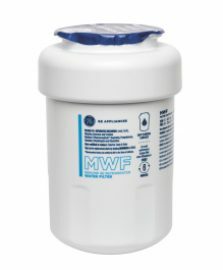 Each EveryDrop replacement filter cartridge contains multiple layers of filter media inside and as the water enters it flows through and the media traps up to 24 known contaminants which include several different pharmaceutical drugs, harmful bacterias, parasites, lead and many other dangerous substances. 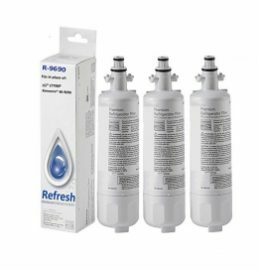 Each filter cartridge is capable of filtering up to six months and then it should be replaced with a fresh cartridge to ensure you always have fresh, great tasting water and ice. 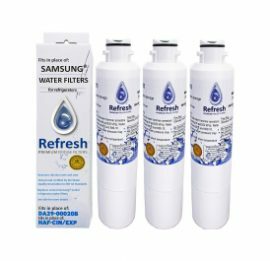 This Samsung compatible refrigerator water filter cartridge from Refresh was designed to replace the OEM cartridge for the water filter systems on all of the Samsung models listed. The high-quality replacement cartridge will help to protect you and your family from a number of harmful contaminants often found in water wells and municipal water supplies. 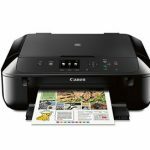 The package includes enough cartridges for up to 18 months of protection. 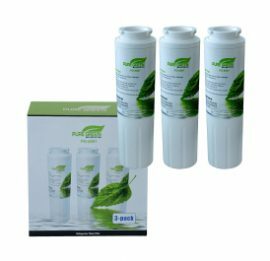 Each refrigerator water filter replacement cartridge features multiple layers of highly absorbent media that help to trap the contaminants as the water flows through multiple layers of material. The filtration removes many different types of contaminants from lead, chlorine, sediment and a number of other things, but it does not leave the water tasting funny or strip away beneficial minerals. The replacement cartridges meet or exceed the government standards for contaminant removal. If you own a Samsung refrigerator that has an automatic icemaker and or ice and water in the door you really should look into using this cartridge in order to save yourself some more. Refresh markets a number of different models of compatible refrigerator water filter cartridges. Depending on what make and model you have will make the difference in what Refresh cartridge that will work for the unit. The replacement cartridge is designed to be used in place of the OEM cartridge from the manufacturer of your refrigerator. The typical cartridge is designed to filter out impurities from your house’s water source so as to prevent the accidental exposure to a number of harmful contaminants. Each of the three replacement cartridges is designed to trap and remove many of the most common contaminants found inside well water and almost all of the typical municipal water supplies. The absorbent materials used in the filter media inside the cartridge is capable of removing lead, chlorine and a whole host of other contaminants. The manufacturer recommends that the filter cartridge in your refrigerator be changed out after 6 months or 200 gallons of water. They go as far as to recommend that you write the date that you replaced the used cartridge in order to make it easier to keep an eye on when the 6 months is up in order to be sure that you don’t go past the 6 months. If you own an LG or Kenmore brand refrigerator you should look into this replacement filter cartridge in order to save money. Most of today’s refrigerators that are fitted with built-in automatic icemakers and or have ice and water dispensers in the door come with some sort of water filtration system built in as well. The system is designed to help remove as much of the dangerous contaminants found in the many modern wells and municipal water supplies. The filter system includes a replaceable cartridge that is designed to trap and remove the impurities as the water passes through it. The Pure Line GE MWF is a high-quality cartridge that has passed a number of governmental testing to prove that it is capable of removing much of the serious contaminants like lead, asbestos and a whole host of other toxic substances. Each cartridge contains multiple layers of absorbent material that traps the particles and other stuff found in the water. The cartridges are capable of filtering up to 200 gallons of water and therefore should be replaced every 6 months. 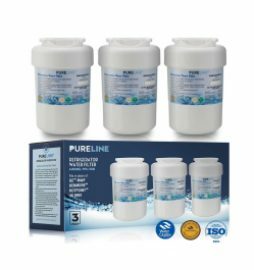 Pure Line sells a number of compatible filter cartridges that will fit with many of the current and past models from a number of the top refrigerator manufacturers. PureGreen uses only activated carbon as a filter media in their refrigerator water filter cartridges. In order to limit environmental contamination in the production of their cartridges, they use only carbon that is made from discarded coconut husks. This type of activated carbon is still capable of absorbing as many harmful toxins as typical media that uses charcoal. The PureGreen filter cartridges for Maytag refrigerators meet or exceed many of the government requirements for water quality. These compatible replacement cartridges are far cheaper than the OEM branded filter cartridges and yet still provide the same 6 months worth of water filtering for far less money. This three pack of filter cartridges are designed to filter up to 6 months of filtering per cartridge, with the whole pack lasting up to 18 months and 600 gallons of water. The cartridges are designed to just pop in place right out of the box, however, there are some models that may require some sort of adapter if necessary. The PureGreen refrigerator water filter cartridge was designed to replace the existing cartridge that came with a refrigerator. It represents a really big value over a typical OEM branded cartridge. The Premium replacement refrigerator water filter cartridge from IcePure is designed to work directly with a number of different refrigerator manufacturers. Since they are compatibles they are considerably cheaper than OEM branded filter cartridges, but they do offer equal quality when it comes to removing contaminants. Each cartridge goes through a number of different processes in order to produce them and meet or exceed government guidelines for contaminant removal. Each cartridge contains several layers of activated carbon that is made from discarded coconut husks which makes it much more environmentally friendly. This type of activated charcoal does not contain any dangerous substances. Each cartridge is designed to filter up to 6 months of water (approximately 200 gallons of water) and therefore this two-pack should last up to a year. If you are worried about high concentrations of lead, chlorine and a number of another dangerous contaminant you should look into this cartridge for your refrigerator. 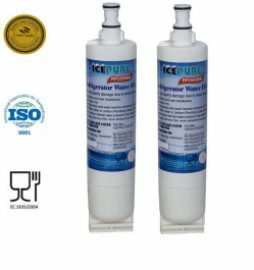 The IcePure Premium Refrigerator Replacement Water Filter is a high-quality replacement cartridge is a much more affordable alternative to OEM cartridges.